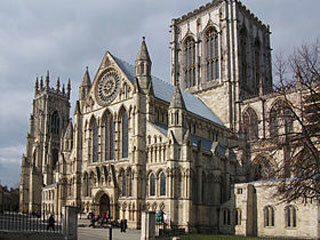 The Cathedral and Metropolitical Church of Saint Peter in York is one of the largest of its kind in Northern Europe. The title "minster" is attributed to churches established in the Anglo-Saxon period as missionary teaching churches, and serves now as an honorific title. Services in the minster are sometimes regarded as on the High Church or Anglo-Catholic end of the Anglican continuum. This article uses material from the Wikipedia article "York Minster", which is released under the Creative Commons Attribution-Share-Alike 3.0 License.